Football is my true love, always and forever. But since football is only around part-time, I cheat with baseball and basketball. So I'm really pumped that my sports and tailgating addiction will be filled this Saturday - we're headed to the Rangers vs Angels baseball game. Like any proper and stylish gameday fanatic, I've already started to prep my essentials for the day. Since it's a noon game, and tailgating will commence early, my menu borders the line between brunch and lunch. Early games call for bloody marys, breakfast tacos, sandwiches, as well as fruit and pastries. While searching for new tailgate drink ideas yesterday, I stumbled upon Bakon Vodka. Whoa! I was instantly excited. I mean, who doesn't love bacon?! Sadly though, I quickly realized I wouldn't be able to pop over to my local beverage store in Dallas and pick some up. It's only sold in certain areas. 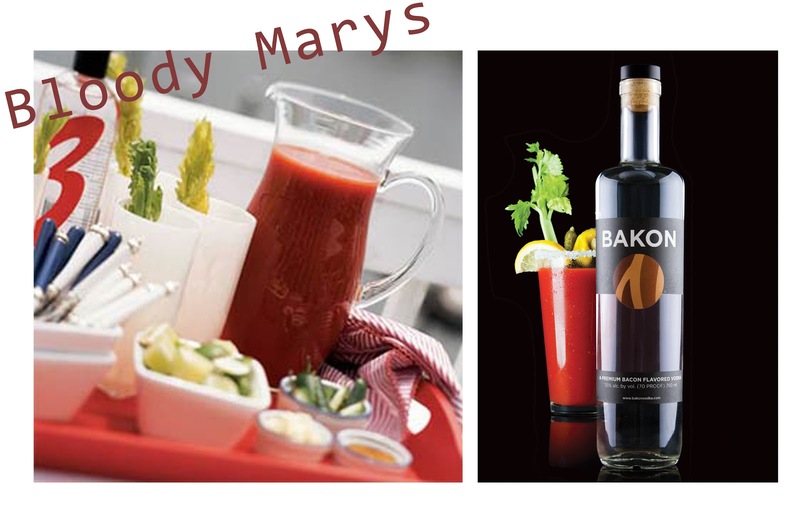 For now, I will make my traditional Bloody Marys but I cannot wait to try their Bakon Mary recipe. Combine all ingredients and pour over ice. Garnish with lime slices, celery stalks, and green olives. Shake and pour into a salt rimmed pint glass. Garnish with a celery stalk and your favorite pickled vegetables.